Blendtec makes some of the best blenders in the world. They have a number of high power, commercial grade blenders. We recently reviewed all of their blenders and wanted to help you understand the 5 different blender categories that are sold on Blendtec.com. We personally like simplistic design and functionality of blendtec blenders. Below is a list of the categories along with a quick section with recommendations. Below is a list of all of the different Blendtec machine categories along with some information about each type. Blendtec has a product comparison page that allows quick side by side comparison of all of their models. 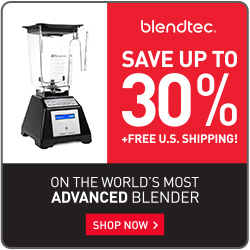 BlendtotheEnd.com has partnered with Blendtec to automatically provide free shipping when using any link from our website. This promotion will allow you to save up to $30. Description: Certified Refurbished blenders mean these blenders have passed inspection and meet the stringent standards we hold for all our machines. With a full 7-year warranty, you can buy a discounted recertified Total Blender Classic with confidence! Blendtec doesn’t have the full line of certified reconditioned machines like Vitamix does, but they do have a better warranty than the Vitamix Certified Reconditioned product line. Description: The Blendtec Classic Series machines give you the ability to create a variety of home-cooked meal quickly and easily. The Classic Series offers tools for quick meals, snacks, and more. The Classic Series machines are available in customized packages to meet your culinary interests. Description: The new Blendtec Designer Series has built to bring a new level of functionality to the high-end blender category without compromising the famous power and efficiency. Description: The latest Blendtec Signature Series combines popular features of other Blendtec blenders in a trendy new design. Description: The Blendtec Professional Series blenders are sleek and have the ability to be installed in the counter top. A great addition for any kitchen. Description: The Blendtec Tom Dickson Extreme blender is the top of the line blender from Blendtec, named after the creator of Blendtec. The Tom Dickson Extreme™ blender has more power than any other consumer blender on the market today. Description: The Blendtec Stealth is simply the most advanced blender on the planet, and also the quietest–blending at the sound level of normal conversation. Blendtec has a number of different blending accessories that will enhance your blending experience. The one accessory I would recommend is the Spoonula. This is a spatula that is built for the square corners that the Blendtec machines have. A great complement to any Blendtec blender. Blendtec has a few different options when it comes to jars/containers. All are great units and all serve a slightly different purpose. Check out the jars page to determine which one works best for you. Blendtec is so certain that you will enjoy your blender, that they have a risk-free 30 day in-home trial. If for any reason you do not like the Blendtec blender, you can contact them to initiate a return. You will receive a full refund minus the shipping expense. This guarantee is similar to Vitamix, except Vitamix will pay for your return shipping. The Blendtec warranty is one of the best in the industry. The 7-year warranty is similar to the Vitamix warranty offered on their blenders. The one difference between Blendtec and Vitamix is that the Factory Recertified models also have a 7-year warranty. Thanks for the message. I took a look at the Blendtec Commercial site and don’t see that being available. I also checked eBay with no luck. Let me know if there is something else you need. Thanks!